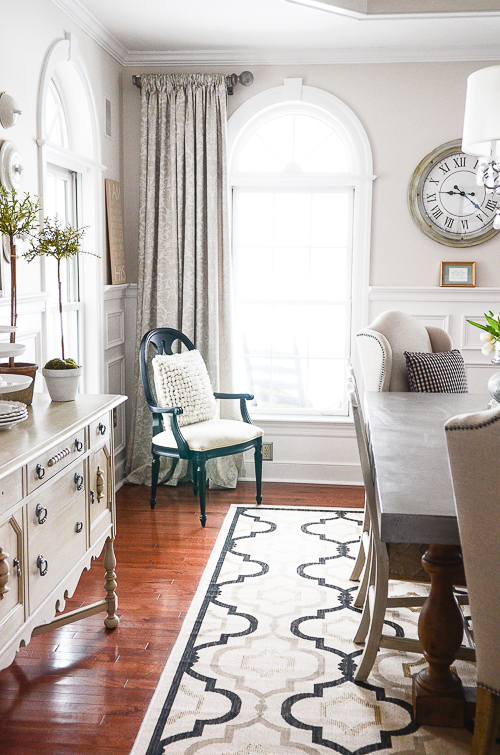 When was the last time you used your dining room? If it’s not getting a whole lot of use it may be because it’s lost some of its luster and beauty. I think many people furnish their dining rooms and never update them! Like me, many of us bought dining room “suites” that cost us a ton and we think it would be almost heresy to change them up! And now they may be looking a little tired. 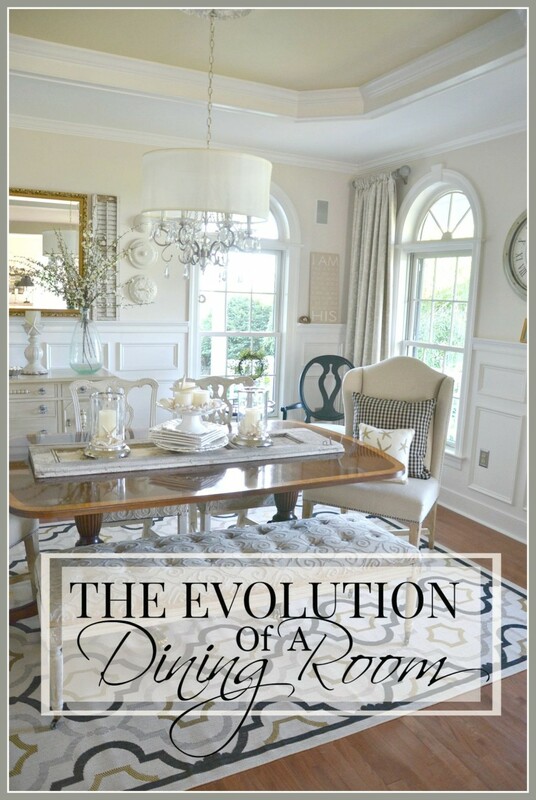 You don’t have to live with a dining room that has seen better days! It’s not hard to find your new style in a dining room. It’s all about being creative and letting go and editing and being very careful about what we add. Today let’s talk about creating your perfect dining room. 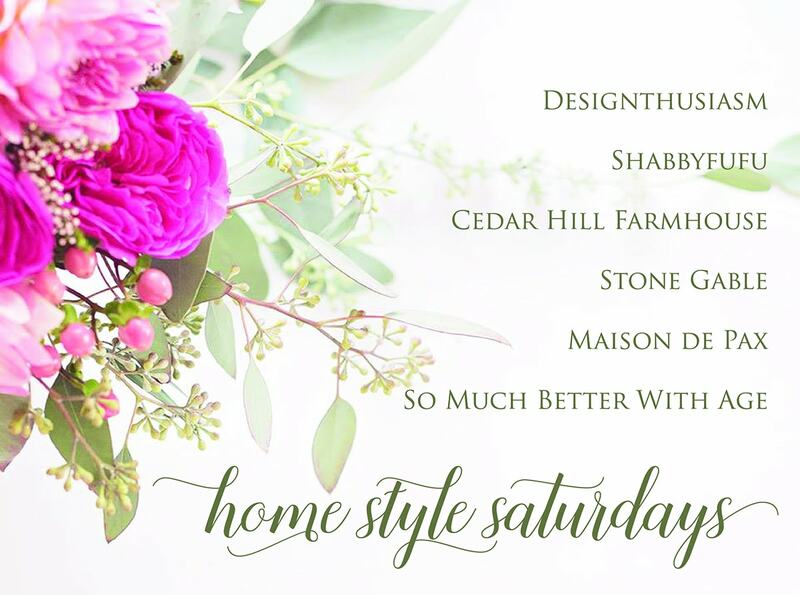 Today is Home Style Saturday! Make sure to check out the bottom of the post and see what my Home Style Saturday friends are sharing! 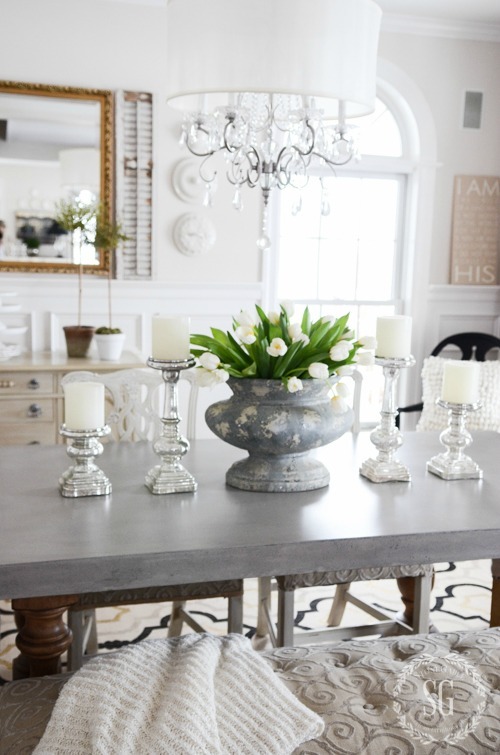 Even more important than finding a style of table you love is finding a dining room table that fits your dining room. Your dining room, no matter the size, should have room for those eating in it to move around. The beauty of table these days is they come in so many sizes and shapes. Earlier this year I got a new dining room table made out of concrete. I took a gamble on it and just love it! It’s a little more narrow than my big mahogany table it replaced and now my guest have some extra room! If you are not in the market for a new table but don’t like your old one why not paint it? 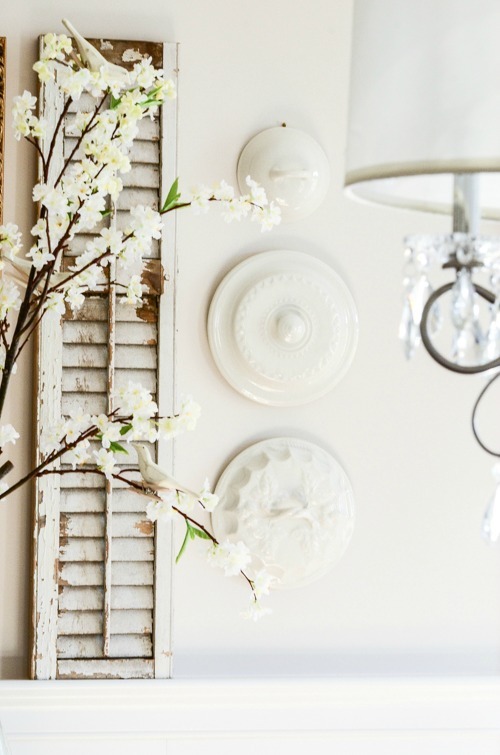 A new color can breathe fresh new like into a room! Take a deep breath and just do it! I know that comfortable chairs sound like a no-brainer. But it’s not always that easy to find the “just right” chair…. ask Goldilocks! Of course, chairs must feel good to sit in but they need to be the right height for your table too. The average height of a dining room table is about 30 inches and a chair should be about 18 inches from floor to seat. This allows enough lap and leg room for most people. 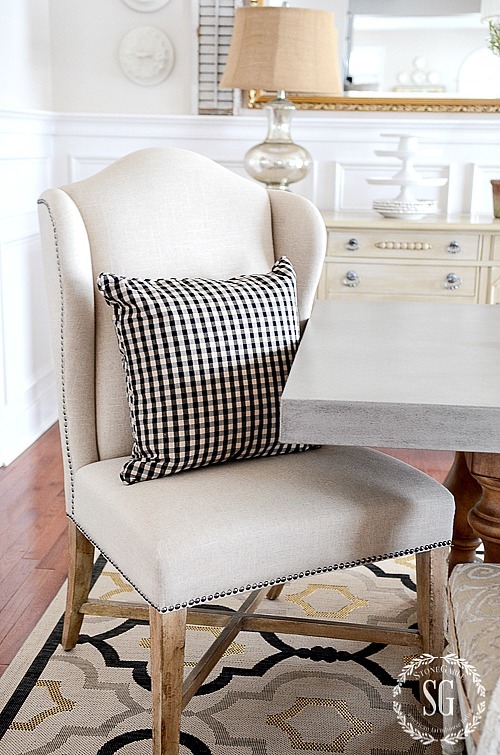 I love the idea of mixing and matching chairs. Gone are the days when a dining room had to be matchy-matchy! An assortment of great chairs looks so chic and fun in a dining room. One of my very favorite designers, Amy Howard has 6 vintage chairs all different in style and condition around her dining room table. I just loved her willingness to elevate a vintage find! 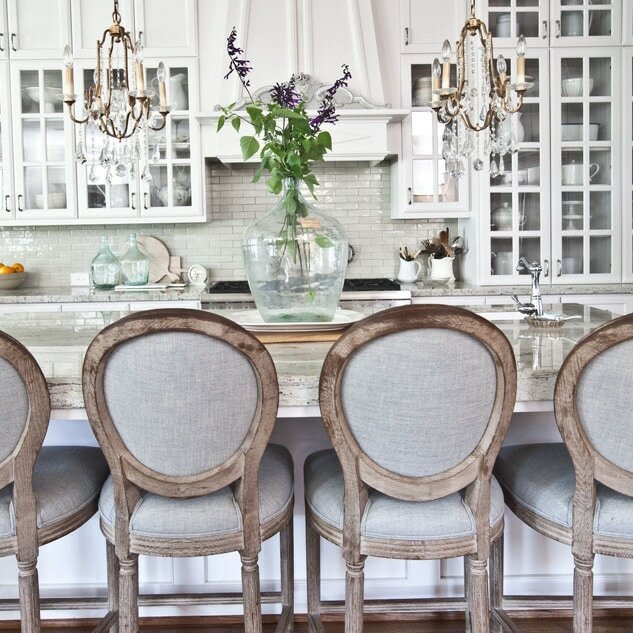 Because of those chairs, her dining room left such an impression on me! She did not paint them or touch them up and they look spectacular! Do you dare? Are you so wonderfully audacious? I painted 6 18th century mahogany chairs that came with my origninal dining suite a couple years ago. And I’m so happy I did! They were in such good shape even though I had them for over 25 years… all they needed was a little updating. Paint and new fabric did the trick. Don’t be afraid to upcycle what you have! My favorite things are those that I have given a second life to! A word about benches. About a year ago I got a bench for one side of my dining room table. I thought it would look amazing!!!! I really like how it looks but my family says it is NOT comfortable for long dinners. The bench is perfect for kids, but not adults. So take that into consideration when thinking about a bench. Notice I have not gotten rid of it. YIKES! 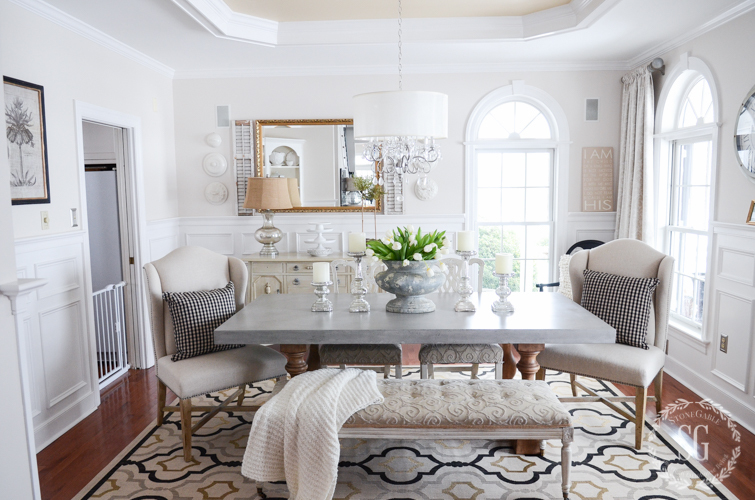 A rug adds visual weight and frames the dining area. 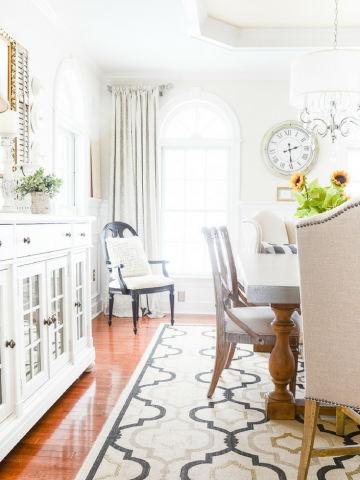 There are so many choices when it comes to a dining room rug. Just make sure it is large enough that when the chairs are pulled out and people are sitting around your table the legs of the chairs stay on the rug. Another must for a dining room rug is that is it durable! Even though you may not use a formal dining room very often, when you do use it it will get wear and spills and feet shuffling over it. A really great idea for a rug is to choose a high end indoor/outdoor rug for your dining room. I found this rug at Ballard Designs. I’ve had spaghetti and orange soda spilled on it and it wipes right up. A rug is not necessary but it gives your room a finished, layered feel! Art, mirrors, open shelves or shutters are such subjective things! It’s all about personal taste! Don’t leave those walls bare! Even a beautifully arranged grouping of dishes can be a fabulous way to lift our eyes up off the table so they can travel around a room. I love love love big mirrors in a dining room. Especially in the evening when they catch candlelight or the light of a chandelier! I chose the best mirror at StoneGable to put in the dining room. It’s gilded and very formal. Standing alone it’s not the perfect fit for this room but I wanted to put it somewhere in the house. It’s uber formal and very traditional. To offset it I added a pair of chippy, grungy shutters to either side of it and a trio of chamber pot lids next to the shutters. The result was exactly what I was looking for… a rustic luxe mix. What you put on your walls does not always have to be art. At StoneGable, it usually isn’t. I even have a pair of framed linen dishtowels hanging on one wall in my dining room! I think my best advice is to go bigger rather than smaller when it comes to art and mirrors. Edit what you have and if it looks cluttered or busy or too small don’t do it! Does your dining room have space to put a buffet, hutch, desk, sofa table, or some horizontal surface? I love the idea of how versatile an additional flat surface in a dining room is! I found my buffet in a vintage shop and painted it! It has storage and a great surface that holds a lamp and a few other decorations. But what I love most about having it in the dining room is it gives me an extra surface to serve from. I can put appetizers or drinks or extra serving dishes or desserts on the buffet. Easy and so accessible! It’s also nice to make this a self-serve area for family and guests. 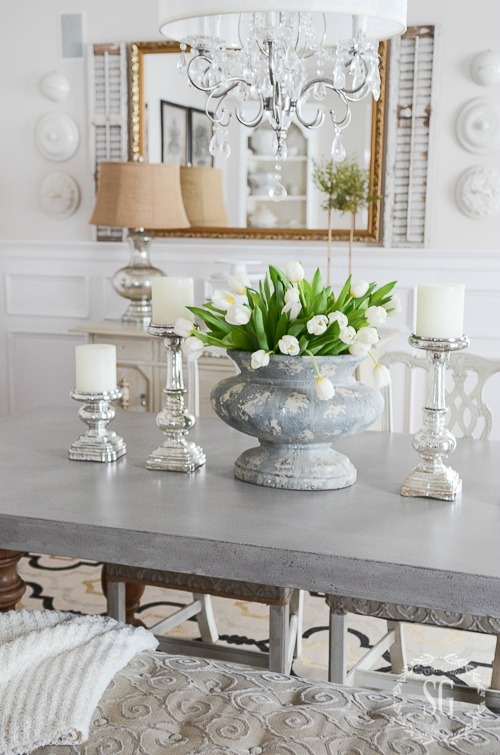 If it’s a matter of having room to walk around your table or an extra surface… opt for the room to walk around! Notice I did not say chandelier? You should have some sort of lighting above your table. Preferably a pendant or drop type of lighting. If you have 8 foot ceilings a light should hang 30-34 inches from the ceiling. Add 3 inches for every foot higher your ceilings are. Family and guests need to see what they are eating and need to see each other. I am not a fan of overhead lighting! No not one bit! It can be harsh and unbecoming. Just make sure you put any overhead lighting on a dimmer! Here’s the part of decorating I love the best! And here is where your personal style can shine! Think about a centerpiece for your table. And candles, dishes, curtains, lamps, a bar cart, extra seating and all the little touches that make your dining room an expression of who you are! Again, no crowding or too many little items. I think one of the biggest mistakes we make as home decorators is adding too much to a room! Keep surfaces decorated but clean looking! Always start with the basics… a great table, comfy chairs, a rug and overhead lighting. Then add what fits into your dining room. You can have a perfect dining room that is just YOUR style! It just means tweaking and editing and painting and upcycling what you have! Head into your dining room and give it a look with a very discerning eye! 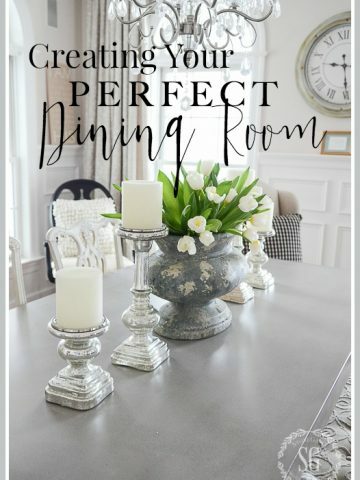 What simple changes can you make that will start the process of CREATING YOUR PERFECT DINING ROOM? Oh my goodness, those framed dish towels! Beautiful! Our dining room and living area are open to each other. We’ve been in this house almost 2 years and I haven’t tackled either area because you can’t really work on one without working on the other! I’m frozen for now. We use our dining room all the time but I LOVE yours! I love the drum shade on the chandelier. Was that your creative genius?! I just might steal the idea. Thank you for all the tips and ideas. I always enjoy seeing your dining room. So pretty and pulled together. I especially like the fabric on the seating. Thank you for great ideas. This was great advice and I love the way you broke things down into manageable chunks. I really love your shutters and framed towels, beautiful! It feels much more relaxed and cozy when textural elements are added. You have given me some great ideas. Thank you! I bot your rug for my diningroom but found that I cannot get out the “waves”…any suggestions? 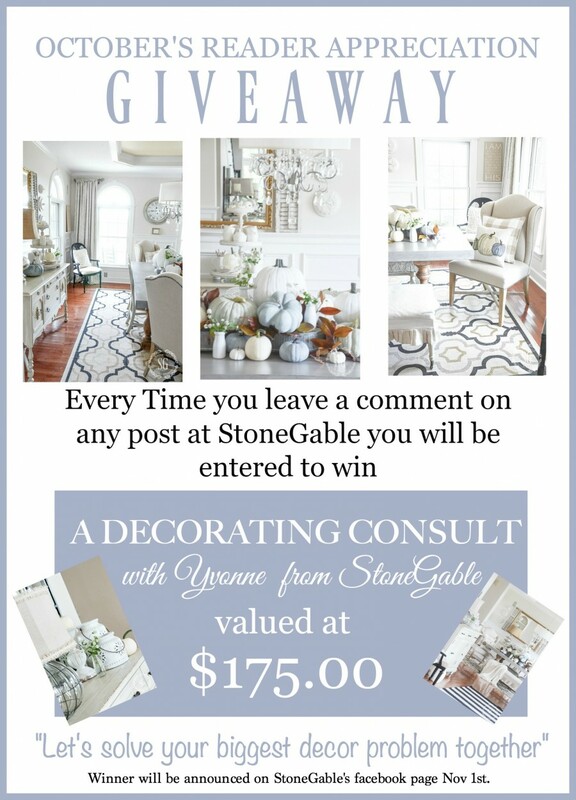 Hi Yvonne, Since reading this post I have been working on my dining room. Would you let me know where you bought the linen dish towels that are now on your wall, I love them! Thanks! Hi Vicki, I found them at the Luckett’s design house in Luckett’s Va. I saw them and took them right off the wall! I love the neutral looks that you create. I do not have a formal dining room. My dining area is my large kitchen. Your ideas inspire me to think outside of the box! Thank you! You have a beautiful dining room. Thanks so much for the great tips! it would be uncomfortable for adults. I love your dining room table and the chairs!!! I had those exact same reproduction chairs that I painted white some years earlier and gave them away because my hubby wanted upholstered backs. The nerve of him…lol! 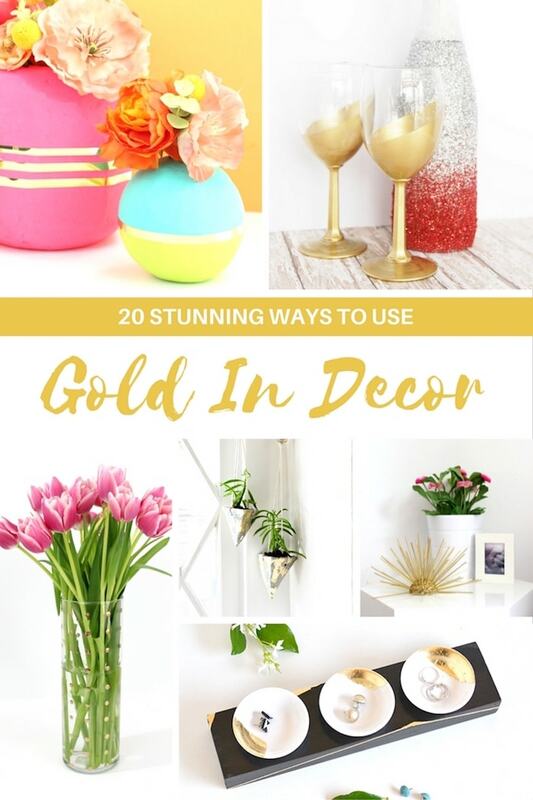 As always, I love your ideas on decorating! However, I cannot get to the other blogs through the links provided. It may be my computer, not sure. I would love to see the other ideas too. Have a great week! A few years ago we changed our dining room to an office. We were only using it a few times a year and in between it was a catch all for almost anything! It gets used daily now! I really like how your new table is more narrow than the old one. I’m gonna need that tip for our new home, as it is very downsized compared to the house we live in now. Love your tips Yvonne! 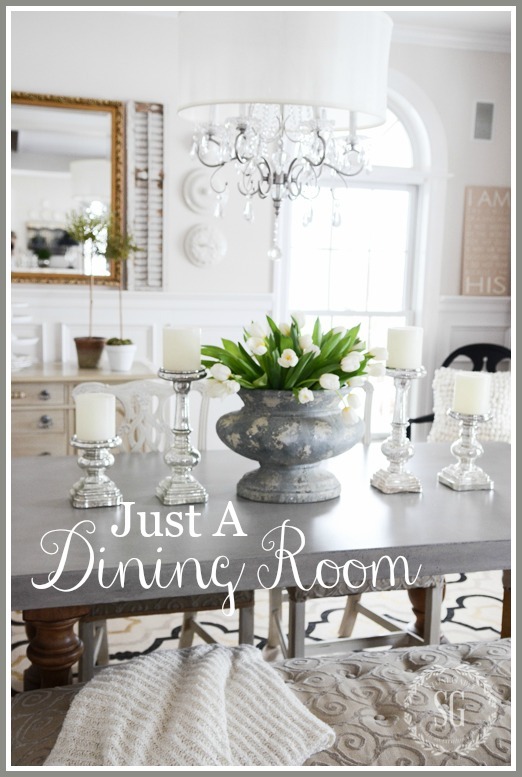 Love your dining room, the table and everything in it. Just beautiful. Love all your decorating ideas!! Have a fabulous Fall!!! Love your blog. It would be lovely to see your dining table and buffet all dressed up with dinner on the table. I just can’t wait to see how it would look all decked up with a holiday dinner. 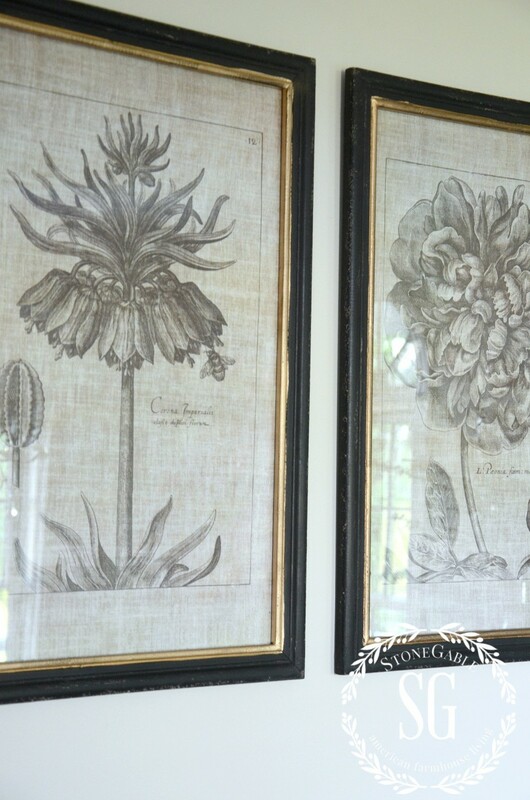 Although I am still partial to your old dining table, I do love your new décor and serves as inspiration. Thank You for your posts. Because of your posts, I have doing my decor differently. Simplifying is the key and I love the look! That is one thing I do not have in my dining room is a rug! I need one. I love the idea of using a high end indoor/outdoor rug. That’s exactly what I have in my living room. Mine has stood the test of time and is super easy to vacuum and keep clean. I have a matching one by the front door. It’s similar to your rug as far as color and design. I should find something similar for the dining room! Great ideas. 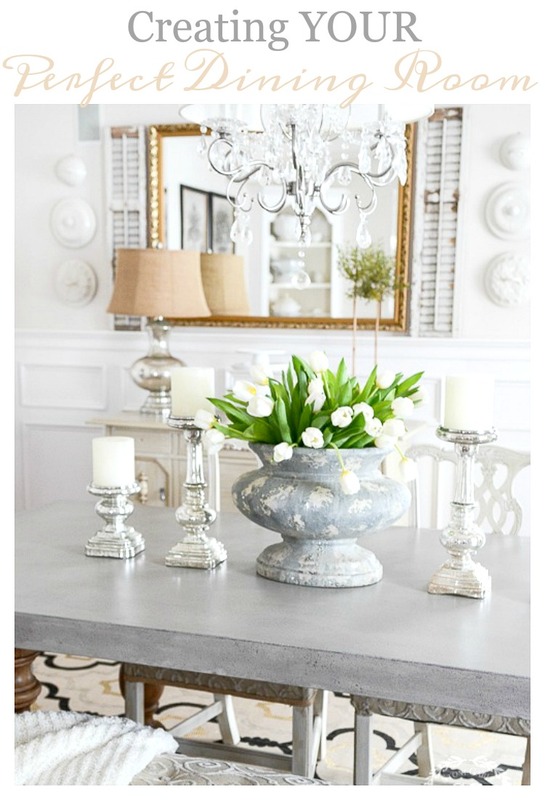 I love a beautiful dining room, with a gorgeous table scape (my favorite)! Yvonne, your dining room is eye catching. You have created a luxurious room for family dining. I am ready to change everything in my dining room. I have been thinking about getting the same concrete table that you have, to replace my oak set from 1988. I like your two upholstered chairs and how they look like wing backed chairs, but take up less space than a full sized wing chair. I want to lighten the room, but am a little afraid to use light colored upholstered chairs because of spills, etc. My husband is very handy and weare also considering putting in a built in to replace my current hutch. So far we are still in the planning stages, but your post came at a good time. Great room (as usual) and great post (as usual)! I recently decided perhaps it was time to get rid of my silk floral arrangement ( I know- I know- it sounds horrid but I don’t think it was THAT bad actually!) that i had centered on my dining room table. I got 3 huge clear greenish glass decanters at Home Goods and have them on there now. I still couldn’t bear to toss the silk arrangement so have that setting on top of a mirrored serving piece in the corner of the room and I love how the glass decanters on my traditional looking table are a juxtaposition as the traditional silk floral on the more transitional serving piece are as well! And I feel so decorator-like for trying something different! I love your dining room! The lamp is gorgeous! I miss my old dining room and the dimmer switch!! This rental eating space is not suited for many guests and barely fits family!! Look forward to having a dining room again. Is your rug an indoor/outdoor? How much area so you need when chairs are pulled out? A foot? Or more? I know some like to leave space, while others like to be right against the table when they eat. Thanks! Love your ideas and I love your dining room. I especially liked the idea of the different chairs. You are braver than I……don’t think I could paint chairs from the 1700’s!!! Hi B, these are not chairs from the 1700’s. They are styled like those of the 1700’s. They are about 30 years old. You have a beautiful home. Where did you get the fabric for your bench and the wooden chair seats? I have an oak dining set. Even tho oak is out of style I just keep it that way. Don’t know what color to paint it! I also use it for crafts, scrapbooking etc.. Comes in handy for many things! Such great advice, as always. You have such a lovely, well thought out home. Wonderful post, as always! We moved to a condo last year. it is only 8 years old & had only 1 owner who lived here only May to September. So it was a wonderful blank (very blank) slate! We bought it for a great price so knew we could afford some changes. Having lived in 6 houses in 30+ years, we were pretty sure what we wanted in this hopefully last house! We gutted the large kitchen & in the area where a table was, we put a large island. There is room for high seated chairs & we eat there often. (as in our last home, it has become the gathering spot for guests!) We have a great dining room that we were committed to using; hence the no-table kitchen! we love to entertain & our dining room is a busy place! Last Spring we ventured into Amish country looking for a bench for extra setting when the table is open fully. Found a beautiful hand-built bench (with a back & arms) that has been perfect for the room.And, on a twist, we pulled a 1980s table, chairs & hutch out of storage, had the green paint removed & returned to it beautiful cherry origin. So beautiful! Enjoy your dining room! Love your dining room. I have also changed my area rugs to indoor/ outdoor rugs. Always making changes to my interior décor, love all your tips and DIY projects. Going to try and bleach pinecones next week can never start to early to think about Christmas projects, especially when you take care of a 16 month old granddaughter three days a week. 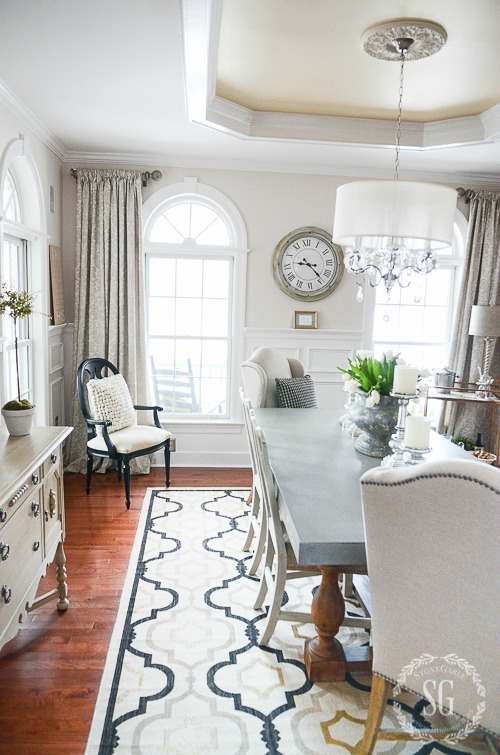 loving the beauty here and the smart direction for dining rooms. mine is presently a reading room which is fine since there is more reading happening round these parts than entertaining these days! 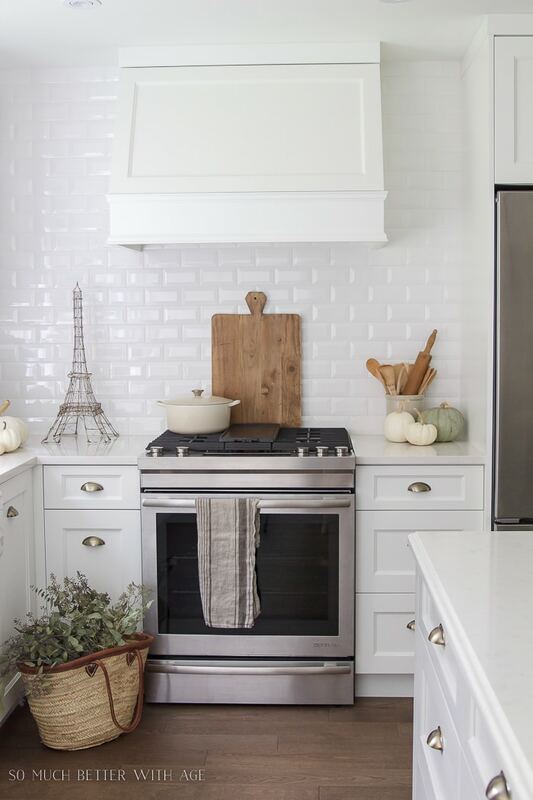 i love the proper look and function of your beautiful space–bravo, friend. peace. Although not fashionable any longer, I want my grandchildren exposed to this type of dining setting. I so love your Blog. We are building a new home and I am getting a lot of ideas from you! Thank you. I was wondering where you got the urn that sits on your dining room table. Love it!! Hi Linda, I found it at HomeGoods. Great advice Yvonne. Love the look of your dining room. Your timing is perfect!! I was sitting in my ho hum dining room last night with a friend having a glass of wine and got to thinking. This room needs a refresh. We will be in our forever home 4yrs at the end of this month and I’m finally ready to put the room to good use. It’s my grandmother farm table & hutch along with some other prices from my “shabby chic” apartment with wall to wall gray carpeting. I think we r going to pull up the rug n lay engineered hardwood floor. I’m going to paint the legs of the table a cream color to match the hutch which my brother stripped n primed a few years ago. Thank you for the tip. I’ll keep you posted on the progress!! Moving in today. 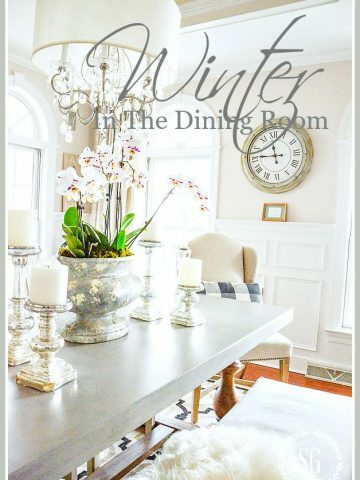 Thanks for the great dining room tips. Your dining room is beautiful. I need something for my walls so this post comes in handy. I just painted and now time for the wall art. You always have images and words to inspire! 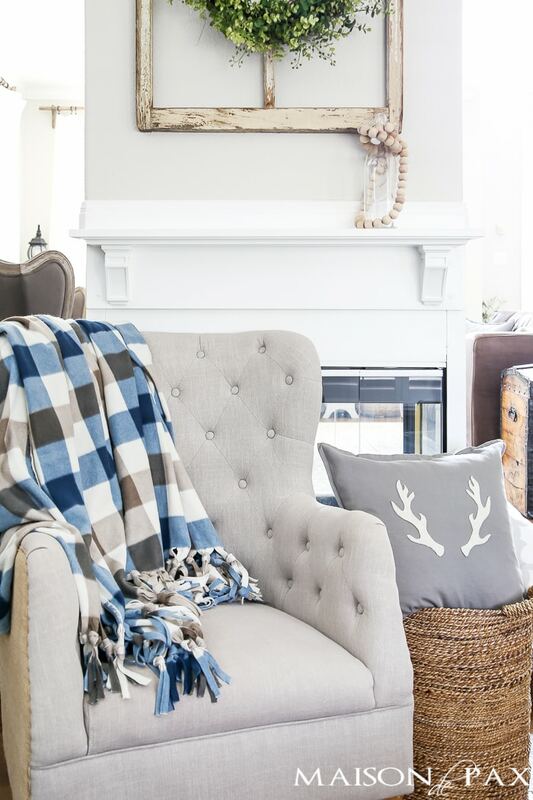 Love the check plaid throw. Love the room. It must hold many family memories. I have the same chandler, in black over my bed. I get many compliments on it. Stunning, I can’t possibly say enough about the beautiful rooms. What is the name of the color on your upper walls in the dining room? Is it a gray or beige tone or both? Thanks. 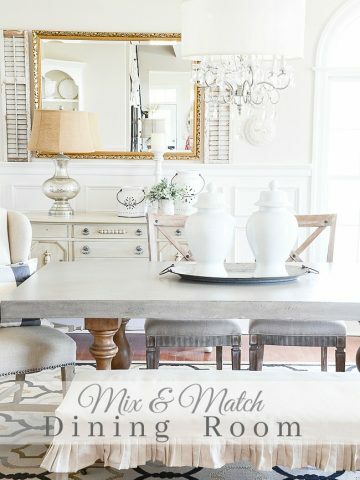 I adore your dining room and am wanting to change mine to make it more neutral and updated! Would so love to have a consult with you! Your ideas are wonderful and your home is amazing! Yvonne, I discovered your blog about 2 1/2 years ago and it inspired me in staging the home where we raised our sons and making it market-ready. We were blessed to have the first couple that walked through make us an offer! That home had many deep colors circa 2000 — teals, golds and burgundies — but I have decorated our new home in all neutrals because I so admired your style. I wish that I had your knack for placing things so beautifully on the walls and for accessorizing with pops of color. Thanks so much for sharing your lovely home with your readers! You always come up with great ideas for your posts. How do you do it? I no longer have a room designated as a formal dining room. It was not used often enough to use up valuable real estate. So, I sold my dining room set and purchased a beautiful round table ( love the base ) and six upholstered chairs to put in the area just off my kitchen. If not using your dining room, why not repurpose it. Yvonne, your dining room is lovely. But your children are right. Benches are uncomfortable to sit at for any length of time. Leave it as a show piece but pull out some chairs for those family dinners. Then all can linger for longer over your amazing meals. Your dining room is so beautiful. Yvonne, your information is excellent. I wonder if the dining room will endure with the lifestyle changes of our culture. We use our dining room however, most people I know don’t. It cost a lot of money to furnish a room that isn’t used except on Thanksgiving and Christmas. Your dining room is beautiful. I’d also love to see Amy Howard’s table and chairs. Beautiful room! I love the fact that you stepped back and took a photo of the entire room, this allows me to see the whole composition of the room, the scale and balance of furniture, accessories and colors. This is very helpful when you take photos like these. Thank you! i needed this post. i wish you made house calls!!!!! come visit me in Boston. I need your help. thanks for the rug tips. never thought of a indoor/ outdoor. I do have a lovely dining room, antiques from 1937 , large table, and it is used every day. why not ? I have it so I use it, I will just change up the dinnerware from casual to formal ( Royal Doultan Tavistock) from lovely quality paper to linen napkins. I do need to consider a new Chandelier but want to make sure that my next chose is really the right one. Your ideas were indeed timely. Wonderful tips! Two things I take away from this is editing my items, less is mores, and up cycling what I have. I’m thinking of painting my farmhouse chairs black to coordinate the dining set with the kitchen. In our new house, the rooms are combined and I want an easy flow. I may paint the base of the table to match the cabinets. What do you think? Love the dining room. We have an eat in kitchen in our new home. I sure miss my dining room? Solid advice. Love your look especially the variations of the seating styles. Good morning! This post is incredibly timely for me! We built our home more than 8 years ago, and I had never been happy with the dining room! The walls were a dark cranberry color, the shape seemed long and boring, and there was a large jut out with floor-to-ceiling windows. 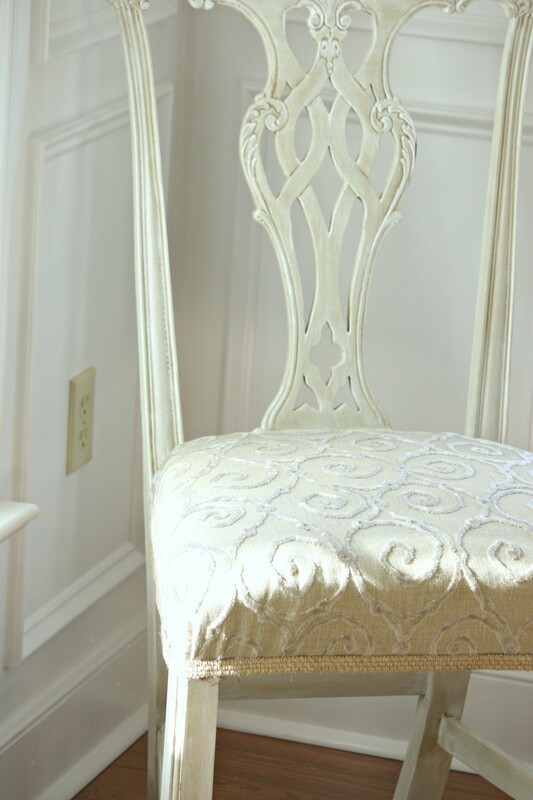 My grandmother’s antique chairs and table – which I love! – didn’t even look pretty! I had a lovely chandy and a large china cabinet, but the room wasn’t attractive at all! 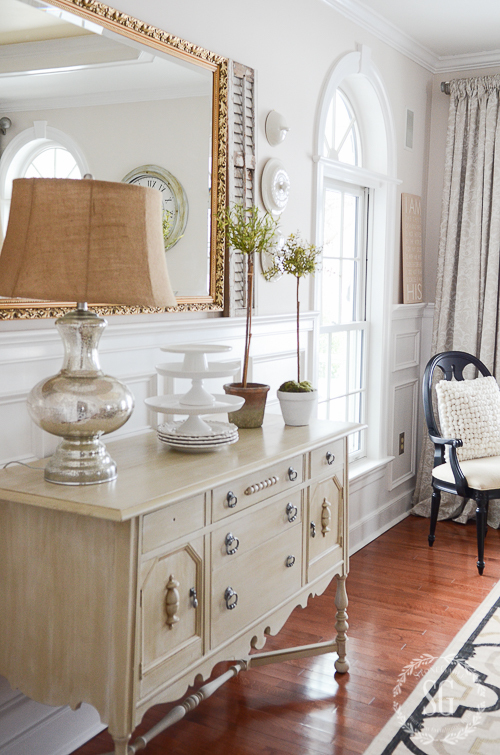 Just a few months ago, I lightened the walls with a soft blue, brought in an antique chest to serve as a buffet in front of the windows, added a comfy french chair next to the chest, brought in some artwork, and…voila! I love my dining room! I shopped my house for everything other than the pretty paint, so for the cost of a can of paint, I LOVE my dining room! It makes me happy! It’s amazing what a can of paint and some “fluff” from other parts of the house can do! I have a large ktchen/ dining area and I always struggle what to put on the table to blend with the whole area. Wish I had a formal dining room! Your dining room always looks so inviting.